The lymphatic system consists of lymphatic vessels and associated lymphoid organs. 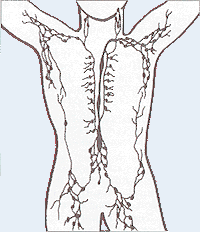 The lymphatic system is a circulatory system that drains fluid from the blood vessels. Lymph vessels are the site of fluid drainage and pump lymph fluid using smooth muscle and skeletal muscle action. The larger vessels contain valves to prevent backflow and pump towards the heart to return lymph fluid to the bloodstream by the subclavian veins. A lymph node is an organized collection of lymphoid tissue through which the lymph passes on its way to returning to the blood. Lymph nodes are located at intervals along the lymphatic system. Lymphoid tissue contains lymphocytes and other specialized cells and tissues that have immune system functions. lymph node: Small oval bodies of the lymphatic system, distributed along the lymphatic vessels clustered in the armpits, groin, neck, chest, and abdomen. They filter through lymph fluid. lymph: A colorless, watery, bodily fluid carried by the lymphatic system, consisting mainly of white blood cells. The lymphatic system is a collection of structures and vessels that drains lymph from blood and has several other functions. It is a circulatory system for lymph fluid and the site of many key immune system functions. The lymphatic vessels are the lymphatic system equivalent of the blood vessels of the circulatory system and drain fluid from the circulatory system. The network of lymph vessels consists of the initial collectors of lymph fluid, which are small, valveless vessels, and goes on to form the precollector vessels, which have rudimentary valves that are not fully functional. These structures then form increasingly larger lymphatic vessels which form colaterals and have lymph-angions (lymph hearts). The larger lymph vessels contain valves that prevent the backflow of lymph. The lymphatic system is an active pumping system driven by segments that have a function similar to peristalsis. They lack a central pump (like the heart in the cardio vascular system), so smooth muscle tissue contracts to move lymph along through the vessels. Skeletal muscle contractions also move lymph through the vessels. The lymphatic vessels make their way to the lymph nodes, and from there the vessels form into trunks. In general, the lymph vessels bring lymph fluid toward the heart and above it to the subclavian veins, which enable lymph fluid to re-enter the circulatory system through the vena cava. The lymphatic system: This diagram shows the network of lymph nodes and connecting lymphatic vessels in the human body. Lymphoid tissue is found in many organs including the lymph nodes, as well as in the lymphoid follicles in the pharynx such as the tonsils. Lymph nodes are found primarily in the armpits, groin, chest, neck, and abdomen. Lymphoid tissues contain lymphocytes (a type of highly differentiated white blood cell), but they also contain other types of cells for structural and functional support, such as the dendritic cells, which play a key role in the immune system. The system also includes all the structures dedicated to the circulation and production of lymphocytes, including the spleen, thymus, and bone marrow.